We finished our trip home from TX on Monday. Which means that I did my normal Monday stuff on Tuesday, which made me think all day that Tuesday was Monday. I know, I'm crazy. Meres is recovering well from her strep. She has never had antibiotics before, so they are doing a good job of eradicating the junk. I am plying LC (especially) with salt water gargles and tall glass of lemon water to kill anything she may have picked up and to boost her immune system. We still have a day or two before we are in the clear (or not). I'm hoping against hope that she doesn't get it. School went well. We buckled down and got to work because we ended up missing two schools days (flu, trip). A lot of doubling up happened, but we are back on track. Two more weeks until Christmas break! I think we are getting our tree this weekend. And I am hoping to completely finish up my Christmas shopping this weekend. And then I will have more tangible excuses to procrastinate on as far as wrapping goes. I've got another colorful, unique recipe for you today. 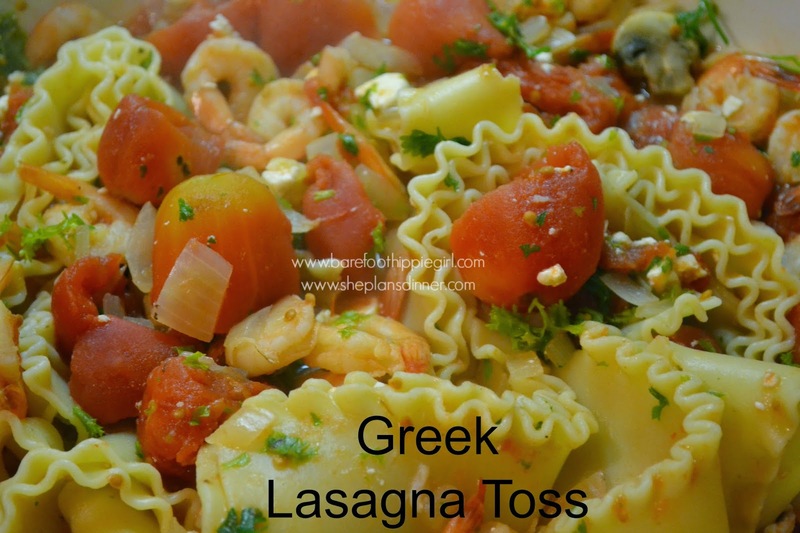 Greek Lasagna Toss. It's unique because it contains shrimp. I know I lot of people don't like or can't eat shrimp, so this is for the rest of us. My kids loved it. They loved pinching the tails off the shrimp before eating it. A fun way to play with their food. They kept trying to pick more shrimp out of the big bowl. It is called Greek for the combined flares of feta and parsley. It is quick to make, and the tastes are fresh because it doesn't stew all day. When I made it, I used the lasagna noodles whole. This made them rather unwieldy for serving and eating. Next time I will break them into 3-4 pieces each before I cook the noodles. Mine also has mushrooms because I had mushrooms and needed to use them up. The recipe does not actually call for them. -In a large pot, cook lasagna noodles just until tender. Drain, and return to pot. -Meanwhile, in a skillet, heat oil over medium until hot. Chop onion, and add to the skillet, cooking until tender, 5-7 minutes. Stir in the tomatoes with their juices, crushed red pepper and oregano. Heat to boiling over high, breaking up tomatoes with side of a spoon. Reduce heat to medium and cook until slightly thickened, about 7 minutes. Stir in shrimp and cook until the shrimp are opaque through, 3-4 minutes. Remove skillet from heat, stir in parsley and feta. 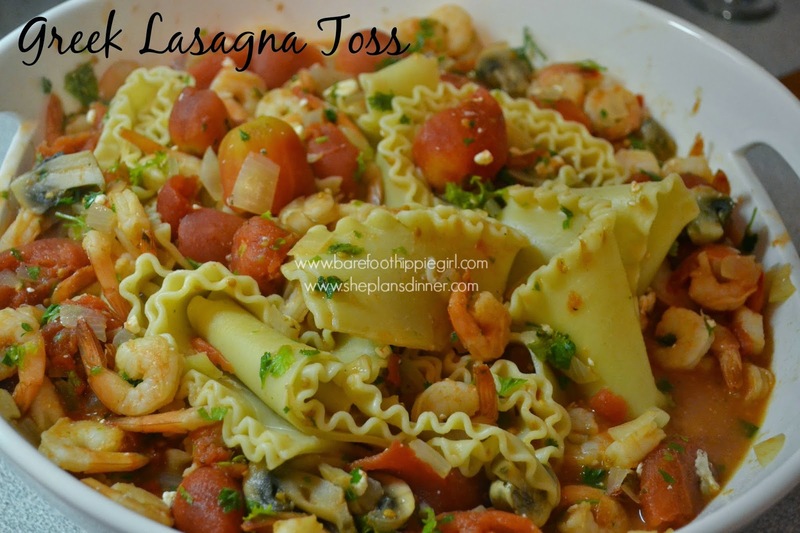 -Add shrimp mixture to the pasta, and toss to coat.